Long-time UPshow partner Big Onion Tavern Group is a hospitality group that specializes in creating venues that are welcoming, unique, and fun. With brands ranging from Fatpour Tap Works and Hopsmith Tavern, to The Irish Oak and more, there’s a good chance that if you’re out and about in Chicago, you’ll stop by a Big Onion venue — and an equally good chance that you’ll be able to post on their UPshow screen! It’s 2019, and traditional restaurant reviews are far from the only factor people use to decide where to eat. In fact, on top of using Instagram to look up restaurants, 30% of millennials say they will avoid a restaurant that is poorly represented on social media. So, when food influencers like @bakedbrie_ stop by, their posts can have a huge impact. Not only does a professional-quality pasta photo get showcased on the screen — Brie is also telling her 2.5k+ followers that Fatpour Tap Works is foodie approved! Hopsmith has a lot of unique ways to make its guests feel important, one of which is the Thursday night giveaway. 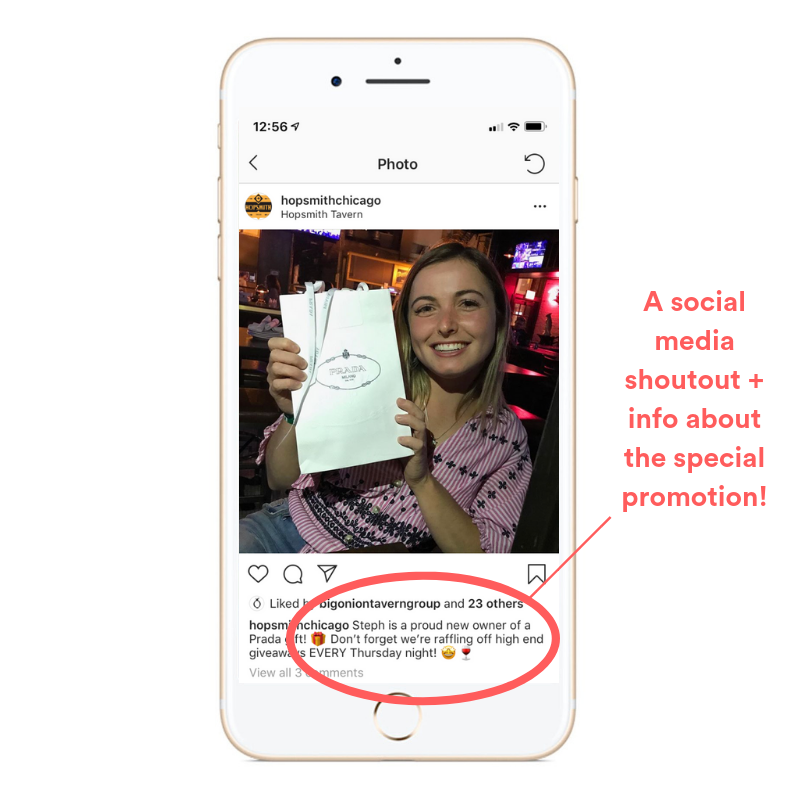 While winning some merch already makes a customer’s night, the tavern takes it to the next level by sharing the winner’s photo on the UPshow screen. Not only does the customer leave with a prize in hand, they also feel valued and acknowledged by the venue, reinforcing their brand loyalty with a guaranteed unforgettable experience. The best marketing strategies are ones that promote your brand while driving further interaction with future marketing. Here, Irish Oak promotes their own social media accounts on the UPshow screen. By promoting these channels while customers are at the point-of-action (i.e. they are already on social media when using UPshow! ), the pub increases the number of people who will heed the call-to-action and follow them on social media.